Marine bio-fouling causes many problems for the aquaculture industry. Colonisation of infrastructure by marine life can cause asset degradation, leading to costly maintenance and/or replacement. 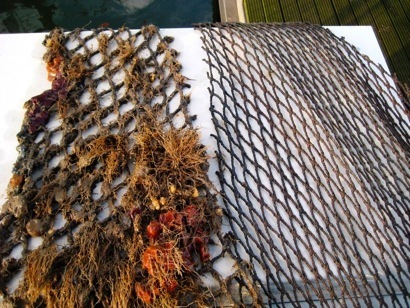 Bio-fouling can also impact on the health of the stock as fouling organisms can reduce flow of water through nets, remove vital nutrients from the water and reduce the amount of oxygen available. One method of controlling bio-fouling is through the use of anti-fouling coatings. The coatings available to aquaculture are often adapted from other commercial uses and have decreased levels of biocides to make them suitable for use with aquaculture species. This means they do not last long and need to be re-applied at least every 12-months. Re-coating is expensive, time consuming and requires proper disposal of waste products. There is, however, a product available to the aquaculture industry that can provide effective, long-term bio-fouling protection. With a proven track record in the leisure marine sector, Cuprotect® is a unique fouling control system that can help minimise maintenance costs whilst providing asset protection. Cuprotect® is available to the aquaculture industry in its original form, affording the same levels of bio-fouling protection available for other marine uses. Cuprotect® is safe to use in aquaculture because it utilises solid cupronickel granules which leach small amounts of copper ions over a long period of time. Ecosea are involved in several trials in Scandinavia, Scotland, Chile, Japan, Canada and the United States to provide an effective, cost efficient and long lasting solution to the problem of aqua-cultural bio-fouling. is untreated. The other net has been coated with Cuprotect®. Water utilities around the world are facing increasing threats to productivity and asset degradation from the spread of Zebra mussels. Originating in Eastern Europe, they have migrated across the globe and are now commonly found in the freshwater systems of Europe and North America. Zebra mussels are highly invasive and with no natural predators they are thriving in their new locations. Their ability to reproduce in vast numbers, survive a range of environmental conditions, and attach themselves to almost any surface means that they grow in significant densities. It is not uncommon to find many thousands of mussels occupying a single m² of surface area. Such densities of population can cause problems for water utilities as pipes and equipment can become clogged with Zebra mussels rendering them inefficient or even inoperative. 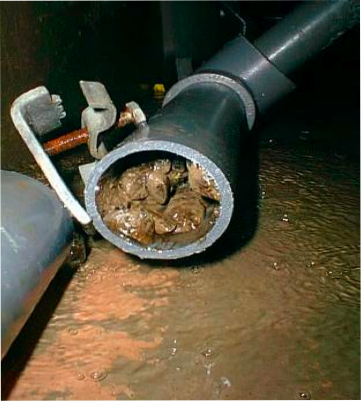 Screens that are placed over intake pipes to prevent fouling entering the system can themselves become blocked. Zebra mussel larvae are microscopic and drift in the water until they find a suitable surface to colonise. It is therefore almost impossible to stop them colonising once they enter a system. Traditionally Zebra mussels were often killed by exposure to lethal doses of potassium permanganate or chlorine, however, negative environmental impacts and increased water quality controls mean that this is no longer a viable solution. There are various other methods of control such as manual removal via scraping, flushing pipes with hot water/steam, and increasing water flow. However, some of these methods are not practical and others incur enormous costs through labour and interruption of the supply system. In any case, none of these controls are permanent and as long as Zebra mussels are present in source water, they will re-colonise – and so the cycle of removal and associated cost continues. At Ecosea, we believe that prevention is better than cure. Cuprotect® is our patented long-life anti-fouling system which is used in some of the harshest marine environments in the world. Utilising the proven anti-fouling properties of copper, Cuprotect®’s surface is inhospitable to marine and freshwater fouling. Unlike other anti-fouling products, Cuprotect® does not contain harmful organic biocides.